One bottle of Snow Blossom – from Yamatogawa Shuzo. Think: fresh & zesty; fruit salad flavours. Two bottles of Mountain Stream – from Tsuji Honten. Think: layered, complex, fresh & young. Two bottles of Konishi Silver (a nama-chozo). Think: light, delicate, refreshing. Due to their unpasteurised nature these sake must be kept refrigerated. 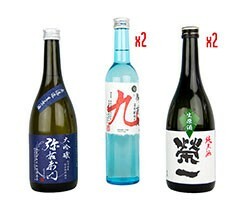 This gives you an idea on how the sakes in our Nama Sake Selection should be drunk: crisp and cold. Allergens: Snow Blossom & Konishi Silver may contain gluten.